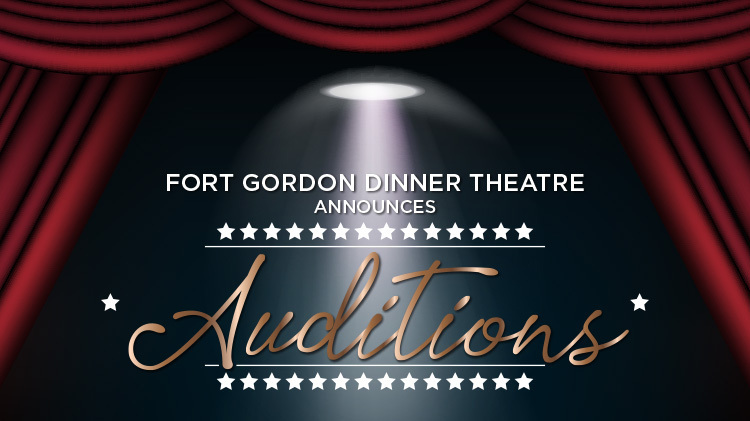 Performance Nights 7 a.m. - 6 p.m.
Fort Gordon Dinner Theatre auditions are open to the entire community! Our professionally staffed theatre program produces a full season of live theatrical productions to include comedy, drama, musicals, children's theatre, concerts and special events. We receive enthusiastic support from the community, and usually play to capacity audiences. Most of our theatre performances are done in dinner theatre format. Fort Gordon Dinner Theatre is the recipient of the Army Entertainment Program's prestigious Irving Berlin Award for programming excellence, and has received multiple top honors in the Best Show, Best Director, Best Actor, Best Actress, Best Set Design, Best Lighting Design, Best Costume, categories of the Army Festival of the Performing Arts. Our productions are staffed by a wide variety of participants from the Fort Gordon and Augusta communities. We are a wide-open group. It’s easy to become involved, and you do not have to be military to be a part of, or attend one of our shows. Since it takes a lot of manpower to produce a theatrical season, we are always looking for new volunteers who want to participate as performers or backstage. No previous experience is required. Our staff members will teach you what you need to know. So, whether you’re young, or young at heart, military or civilian, if you have the interest, call +1 (706)793-8552, contact us through this website, or stop by the Performing Arts Center, Building 32100 on 3rd Avenue. There’s no question about it… we want YOU to be a part of our program!